This Saturday started early. Actually I set my alarm clock for 7 am, but I was so excited I was up by 6 am. It was Archery day! The last one of the year, so yes, I wanted to be there early so I could practice more. The trip was easier than last time becase this time I knew the way. There was, however a little situation I wasn't aware of: since this was the last day and it wasn't part of the course I paid to the University, but a day of the Archery Club, they were taking level exams. All the archers tried at 10, 15, 20 and 30 meters and if they passed (at least 3 arrows out of 6 in the red rings of the target), they've got a level designation going from 1 to 4. Only another guy and I were sort of new - one lesson each previously. The head of the club was a bit lost about what to do with us, but invited us to stay and told us we could practice on the 10 meter target when all the archers have passed the first level. That waiting took about two and a half hours. It was cold and a bit messy, but it was interesting. 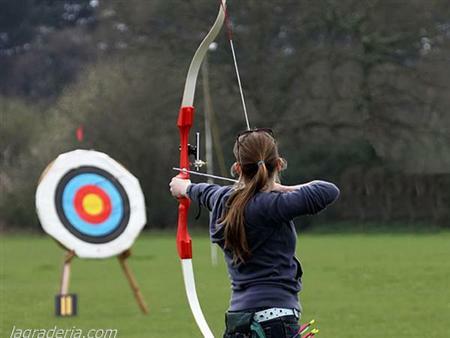 Most people used recurved bows (the regular ones, like the one the girl is using in the picture), basically because those are the ones the Club and the University has for lending. However some people brought and tried out for tests composed bows. Those are not so pretty. Those are smaller and have many strings and little wheels on the end. I don't like them. After two and a half hours, the guy and I finally got to the target, so I strapped on a full lenght armguard, a tap, and grabbed one of the black bows. Last week I shot with a 20 pound bow, but someone took that one, so I went for a the 16 pound one. This doesn't mean that the bow weights 16 or 20 pounds, but has something to do with the force the bow can produce in a shot. The 16 pound feels softer too, and as result it won't send your arrow that fast. Since I had other plans, I practiced for 30 minutes, time during which my right hand got red between the thumb and the index finger due to the pressure of the bow. It was nice to hear the instructor compliment me on my shooting, which wasn't perfect, but rather good for someone with as much knowledge as I have. After archery I went to the mall close by to get some stuff for my lawnyarns and grab some lunch. I tried out a pizza hut place in a style I haven't seen before. All the personal pizzas had cheese in the edgem though I didn't know about it, and they offered other styles of pizza than the regular ones for a personal pizza. Reception Room of the Old Airport. Carved mural. From there I went to my favorite part of my program: the Costa Rican Art Museum. I wanted to go yesterday after work, but the museum closed right before my nose, so I couldn't explore it. I was curious and wanted to know what kind of art would they show. Well, I was taken off my back. The expositions were basically about a turn of the century painter-sculptor, Paco Zúñiga and a second half century sculptor called Néstor Zeledón. The sculptures weren't all that nice, with lot of emphasis on the torso and the hips of all the human figures. All the hips were large or bony, and all the ribcages stuck out. There was one carving I liked a lot because it worked using traditional Mayan designs. The paintings and sketches, however, were beautiful. There were a few I didn't like that much, but the ideas and the general style was beautiful. I also discovered Juan Manuel Sánchez, an artist who did the beautiful drawings for many of my childhood fairy tales. :-) It was such a beautiful experience! Then, as this museum is located in the building of the old airport, the reception room was left empty so the guests could check out the beautiful carvings that told the history of Costa Rica from the pre-Colombine time to 1940, when the Airport was built.